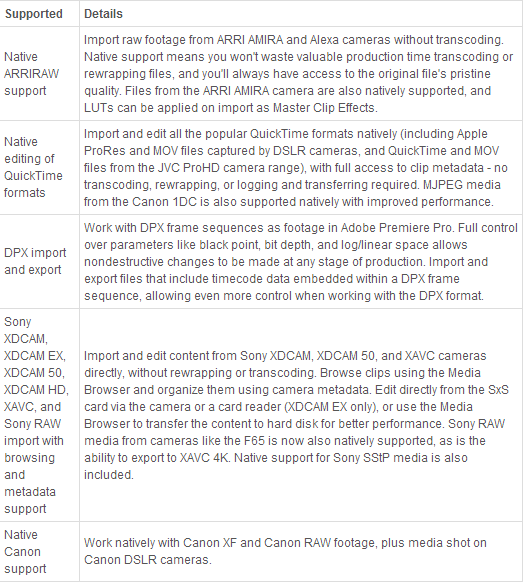 Home Blog What File Types Does FCP/iMovie/Avid MC/Premiere Pro Support? 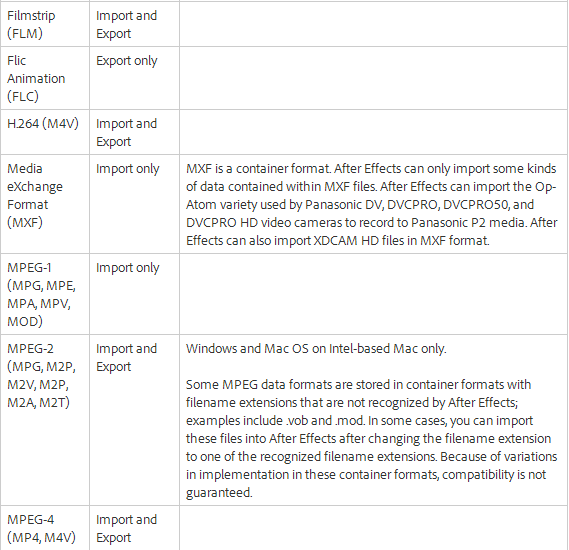 What File Types Does FCP/iMovie/Avid MC/Premiere Pro Support? Wanna make a movie with amazing effects and tell your own story with your nonlinear editors- which allows trimming or modifying video clips, appending or merge multiple video clips and outputing the final product into a video file? Prior to the video editing, the most basic decision you need to make is what's the best video format for editing. 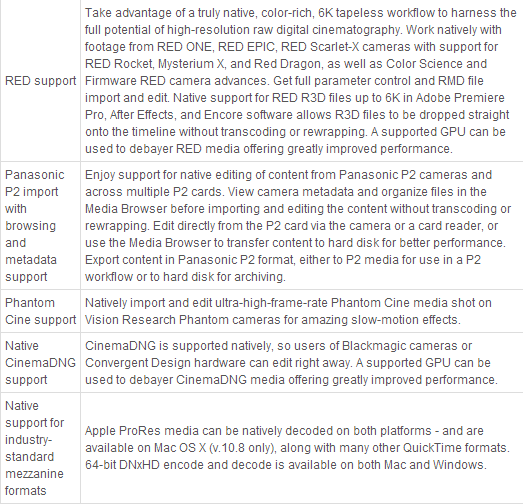 If you've been looking around, here lists the answers of the best video formats supported by Windows and Mac nonlinear editing software like FCP, iMovie, FCE, Avid Media Composer, Adobe Premiere Pro, Apple Aperture, Adobe After Effects, DaVinci Resolve, Windows Movie Maker, Sony Vegas, Pinnacle Studio, CyberLink PowerDirector, GoPro Studio, etc. Note: iMovie'11 (Version 9.0), as part of the iLife'11 package, now supports the AVCHD Lite format (a subset of AVCHD format limited to 720p60, 720p50 and 720p24 ). Aperture 3 works with a wide variety of video formats. 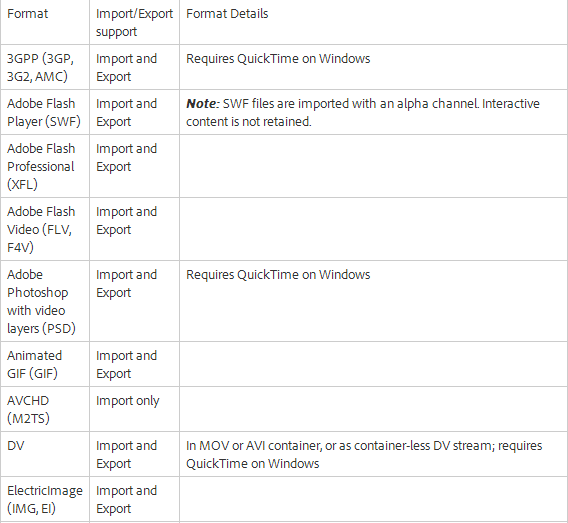 But not all QuickTime-compatible video formats are supported, and some other compression options, codecs, and frame rates are not supported. DaVinci Resolve allows full unlimited editing and grading of DPX, CIN, EXR, QuickTime, ProRes, DNxHD and MXF files all in real time. If you have commonly used media folders for slates or bumper graphics you can quickly access them with one click using “Favorites” or import TIFF, JPEG, MOV, TGA , BMP and every other supported file just by dragging it in from the your desktop! 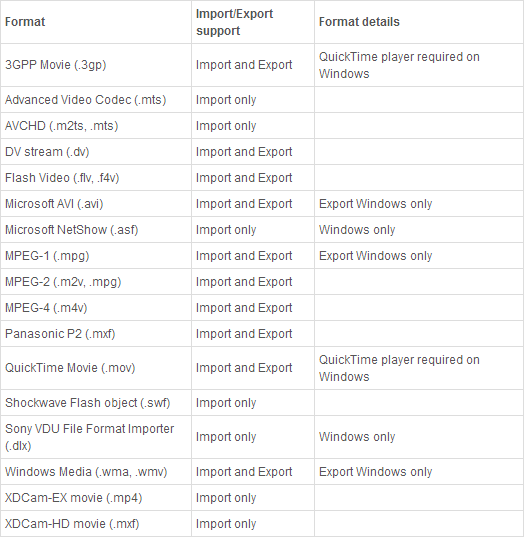 The following formats can be imported into "Step 1: Import & Convert" and converted into GoPro CineForm files for use in "Step 2: Edit". 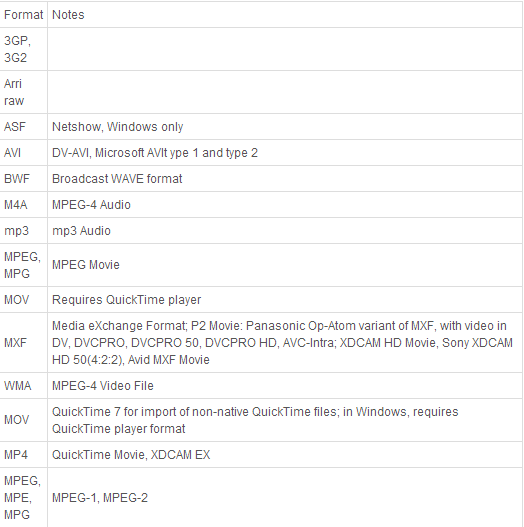 And as we can see, GoPro Studio does not support the video formats mentioned in the title, which are AVI, MKV, WMV, FLV, RM, MPG and some MP4 or MOV videos. 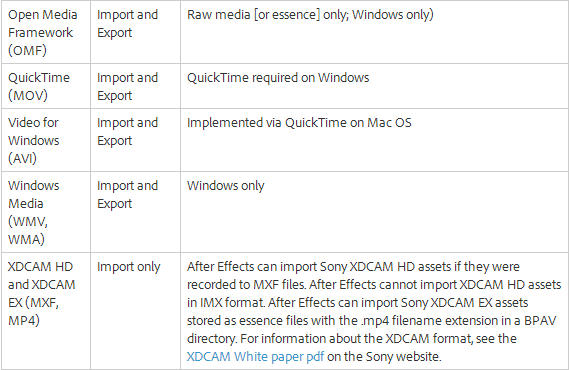 Part III: What if importing unsupported videos to Non-linear editing software? 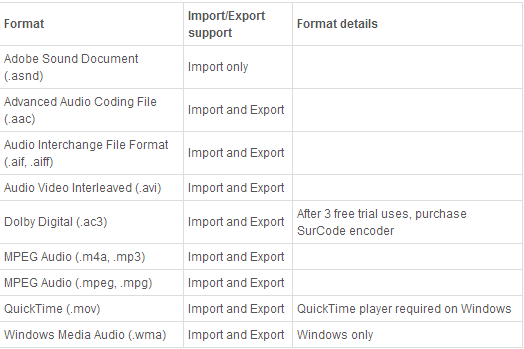 Now you can import and work with the above video and audio formats in these Windows and Mac Non-linear editing software for editing. However, the file formats they support are limitless and you cannot exhaust it. 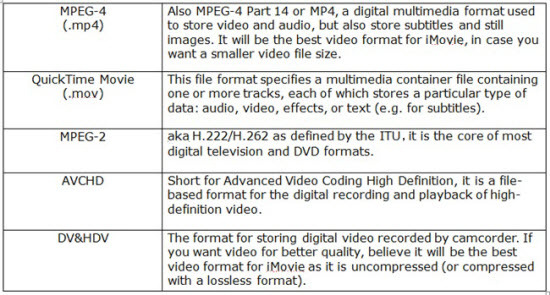 Supposed you have stored certain videos with other video formats like AVCHD, MTS, MKV, AVI, FLV, WMV, etc. and long to load them in FCP, iMovie, FCE, Avid Media Composer, Adobe Premiere Pro, Apple Aperture, Adobe After Effects, DaVinci Resolve, Windows Movie Maker, Sony Vegas, Pinnacle Studio, CyberLink PowerDirector, GoPro Studio, etc. for editing, what could you do? 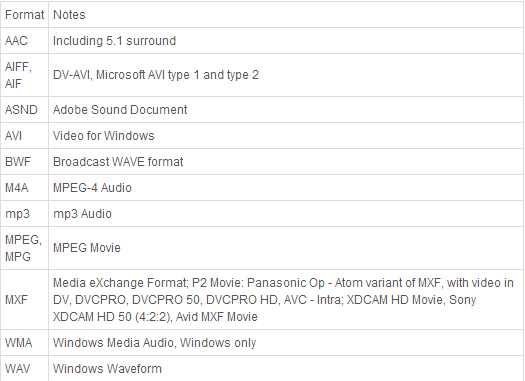 Well, the simplest way is to convert these videos to Non-linear editing software supported video formats. To achieve this goal, a professional yet easy-to-use video converter is essential. 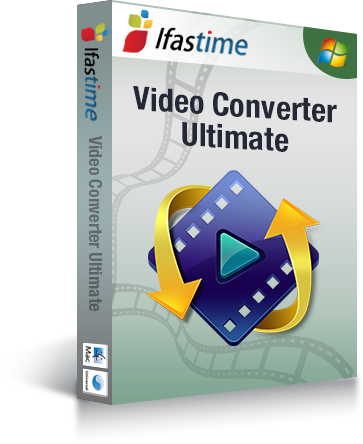 Fortunately, You can put stock in iFastime Video Converter Ultimate or iFastime Video Converter Ultimate for Mac. With it, you can convert almost any video to best video format for editing with the greatest quality. With 200+ video and audio codecs supported, this video converter for Mac (Windows 10/El Capitan) can convert any video to the best video format for editing, so that you can import your camcorder recordings, YouTube videos, or TV shows to your Non-linear editing software without any problem. If you think video compatibility issue is too troublesome, this tool can be taken as a much easier video editing tool which allows you to compress video files with intact video quality, split video to small parts, merge video into one, trim video to remove unwanted areas, add SRT subtitle, add watermark to personalize footage, and many more. Tips for you: Apart from converting and importing video to Non-linear editing software on PC/Mac, this best-ever converter program can also bring you an amazing experience to fast convert almost all the video to a raft of devices without losing video quality, like MKV to Apple TV, AVI to Windows Media Player, MP4 to PS3, 3D YIFY on Gear VR 2015, YouTube to MP3/FLAC and more with 200+ preloaded profiles offered, so no worries about video compatibility. Of course, along with those Non-linear software, there are some other Transcoding software which comes with re-compress fuction to enable the user to convert to and from the video & audio files. 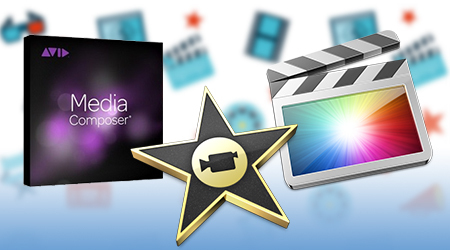 Available on Windows: iMovie, Final Cut Express, Final Cut Pro, Adobe After Effects, Adobe Premiere Elements, Adobe Premiere Express, Adobe Premiere Pro, Avid Symphony, Clesh, FORscene, Media Composer, Roxio Toast, etc. Available on Mac OS X: QuickTime Pro (Apple Inc.), Video Converter for Mac, etc. 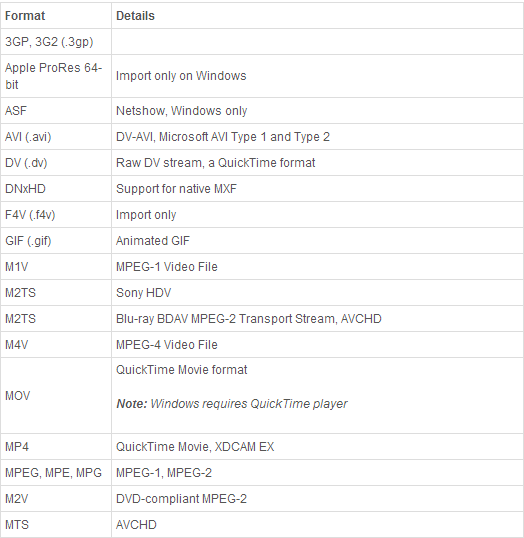 Available on Windows: DVD Flick, FFmpeg, HandBrake, VLC Media Player, WinFF, etc. 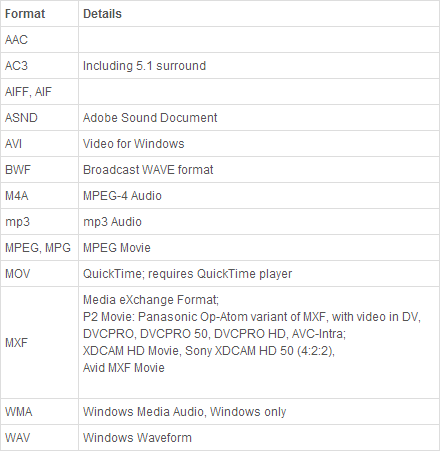 Available on Windows: FormatFactory, Ingest Machine DV, MediaCoder, MPEG Streamclip, SUPER, TMPGEnc, Windows Media Encoder, XMedia Recode, Zamzar , ZConvert, etc. We are happy to hear your voice to reflect newly available nonlinear editing software information. Enjoy your editing work! How to Stream Any Video to Chromecast 2?